Hillary Clinton has taken big strides toward securing the Democratic nomination by winning all five primaries in a multi-state vote for US presidential poll after her rival Senator Bernie Sanders conceded defeat in keenly-contested Missouri. Sanders, who was trailing by just 1500 votes in the Missouri primary elections on Tuesday, said he would not request for recounting of votes and has conceded defeat to Clinton. “I prefer to save the taxpayers of Missouri some money,” Sanders said through spokesman Michael Briggs yesterday. The 68-year-old former Secretary of State has swept the ‘Super Tuesday 2.0’ by bagging Florida and North Carolina while also posting crucial victories over Sanders in the industrial Midwest by taking Ohio and Illinois. Results of the Republican presidential primary in Missouri is yet to be officially declared as it is too close to call. Front-runner Donald Trump is leading his rival Senator Ted Cruz by 1700 votes. So far, Cruz has not conceded defeat. Since the margin of victory in each case is less than one percentage point, CNN and other US networks said they will not project a winner in either contest. Missouri saw more than 1.5 million ballots, or 39 per cent of registered voters, cast on Tuesday. That was the highest amount recorded for a Presidential primary in Missouri history. The previous record of 1.4 million, or 36 per cent, was set during the 2008 primary. WEST PALM BEACH, Fla.—Democratic front-runner Hillary Clinton won critical presidential primaries in the industrial Midwest and completed her sweep of the South on Tuesday, as she took full command of a contest that has been far more competitive than expected at the start. Rival Bernie Sanders was still hoping to win in Missouri, where the result was too close to call. But even a Missouri win for Mr. Sanders seemed nowhere near enough to change the dynamic of the race. Mrs. Clinton won in Ohio, Illinois, Florida and North Carolina, and blunted Mr. Sanders’s momentum from a win last week in Michigan. She widened her already formidable delegate lead and made it improbable he can catch up. “We are moving close to securing the Democratic Party nomination and winning this election in November,” the former secretary of state and New York senator told cheering supporters in Florida, boasting that she has won more votes than any candidate in either party. She took a swipe at Mr. Sanders, saying he should be more specific about his plans, but she lodged a wholesale indictment of Republican front-runner Donald Trump. “When we hear a candidate for president call for rounding up 12 million immigrants, banning all Muslims from entering the United States, when he embraces torture—that doesn’t make him strong. It makes him wrong,” she said. With 214 pledged delegates at stake, Florida was the night’s biggest prize, while Illinois had 156 pledged delegates and Ohio 143 up for grabs. They will be awarded proportionally. Heading into Tuesday, Mr. Sanders was ramping up his attacks on Mrs. Clinton, and has vowed to fight all the way to the summer convention. But he may now face increasing pressure to back off and revert to his earlier role as a candidate primarily driving a progressive, populist message rather than pursuing a viable path to the nomination. At his election night rally in Arizona Tuesday night, though, Mr. Sanders showed no signs of backing off. He pointed to Wall Street contributions to the super PAC supporting Mrs. Clinton and repeated his call that she release transcripts of her high-priced speeches to Wall Street firms. In a statement issued late into the night, Mr. Sanders said the race was still winnable. “With more than half the delegates yet to be chosen and a calendar that favors us in the weeks and months to come, we remain confident that our campaign is on a path to win the nomination,” he said. With nearly all precincts counted, Mrs. Clinton topped Mr. Sanders 64.5% to 33.3% in Florida, by 54.6% to 40.8% in North Carolina and by 56.5% to 42.8% in Ohio. In Illinois, her margin was much closer, some 50.3% to 48.9% with 98% of precincts reporting. Mrs. Clinton had been expected to easily win Florida, with the state’s demographics and rules barring independents from participating helping her. But Ohio was closely fought, and Mr. Sanders had hoped to parlay a victory last week in Michigan to the neighboring state. Both have seen a drain in manufacturing jobs, and Mr. Sanders put the blame squarely on free-trade agreements that Mrs. Clinton has long supported. Mrs. Clinton completed a sweep of the South, where strong support from African-Americans pumped up her totals. But her Ohio win was more important, showing she could win in the industrial Midwest. After Tuesday’s vote, Mrs. Clinton was assured of adding at least 253 delegates to her column, bringing her total pledged delegates, who are chosen by the voters, to more than 1,000. Mr. Sanders was sure to add at least 124 delegates, but he was on track to end the night more than 300 delegates behind. Including superdelegates, who can vote for any candidate they like, her total topped 1,400, more than double his. At roughly the halfway point of the race, Sanders advisers say they now have the advantage, with friendlier states set later in the calendar. His campaign now looks ahead to contests next week in Arizona, Utah and Idaho, three states where aides have hoped to do well. But the next big delegate hauls aren’t awarded until April: first in Wisconsin, and then the giant prize of New York, where Mrs. Clinton lives and which she represented in the Senate for eight years. In Florida, Mrs. Clinton’s advantage was on display Tuesday in Miami, home to large populations of Hispanic and African-American voters who have gravitated to her campaign. The race was closer in Ohio, where Mr. Sanders hammered his anti-free-trade views in recent days. Mrs. Clinton tried to recast her trade message, but the attempt fell flat with at least some voters. “The Clinton history with trade policies, that really just killed our area,” said Fred Woke, a 57-year-old radio announcer who voted for Mr. Sanders in Niles, in northeastern Ohio. The question now is what tone Mr. Sanders will adopt in coming days. In the leadup to Tuesday’s contests, the Vermont senator targeted Mrs. Clinton’s record of support for free-trade deals, and for the backing she receives from an outside super PAC. Earlier in the race, Mr. Sanders vowed to avoid negative attacks, but he has amped up his critique in the weeks since voting began. On the stump leading into Tuesday’s voting, he suggested Mrs. Clinton is in the pocket of Wall Street and connected her support for free-trade agreements to an exodus of manufacturing jobs across the Midwest. The challenge for both Democrats is that Mr. Trump, should he win the Republican nomination, would be an unconventional opponent who could pick up some of Mr. Sanders’s populist arguments. In 2008, Mrs. Clinton herself continued to compete in presidential-primary contests against then-Sen. Barack Obama even though he remained ahead in the delegate race the entire time. Steve Schale, a Democratic consultant in Florida who voted for Mrs. Clinton, said he doesn’t worry that the Sanders attacks will damage her, partly because Democrats are sure to unify if Mr. Trump is the nominee. “You want to get Democrats over the Sanders-Clinton thing, give them five seconds to think about Trump being within five feet of the nuclear codes,” Mr. Schale said. He said he saw no mathematical way for Mr. Sanders to overcome Mrs. Clinton’s delegate lead, and said a protracted primary fight would occupy time that the Clinton campaign could be using to prepare for the general election. Hillary Clinton has run to the right of the Obama administration on every major foreign policy issue — and she’s left a trail of devastation in her wake. It got even more awkward after that. We thought the easiest way to prevent harming women, children and other living things in Iraq was to stop a war of aggression, a war over weapons of mass destruction that UN inspectors on the ground couldn’t find — which were, in fact, never found, because they didn’t exist. Clinton, however, was steadfast in her commitment to war: She said it was our responsibility to disarm Saddam Hussein, and even defended George W. Bush’s unilateralism, citing her husband’s go-it-alone intervention in Kosovo. But that’s just what she did, by supporting the Iraq war and draining our nation of over a trillion dollars. That money could have been used for supporting women and children here at home. It could have been rerouted to the social programs that have been systematically defunded over the last few decades of Clinton’s own political career. Not to mention the war ultimately snuffed out the lives of thousands of U.S. soldiers — for absolutely no just cause. If Clinton supported the Iraq war because she thought it politically expedient, she came to regret her stance when the war turned sour and Senator Barack Obama surged forward as the candidate opposed to that war during the presidential race in 2008. But Clinton didn’t learn the main lesson from Iraq — to seek non- violent ways to solve conflicts. Indeed, when the Arab Spring came to Libya in 2010, Clinton was the Obama administration’s most forceful advocate for toppling Muammar Gaddafi. She even out-hawked Robert Gates, the defense secretary first appointed by George W. Bush, who was less than enthusiastic about going to war. Gates was reluctant to get bogged down in another Arab country, insisting that vital U.S. interests were not at stake But Clinton nevertheless favored intervention. When Libyan rebels carried out an extrajudicial execution of their country’s former dictator, Clinton’s response was sociopathic: “We came, we saw, he died,” she laughed. That sent a message that the United States would look the other way at crimes committed by allies against its official enemies. In a weird bit of rough justice, the political grief Clinton has suffered over the September 2012 attack on a U.S. diplomatic outpost in Benghazi that killed four Americans might never have occurred had Clinton not supported the U.S. intervention in Libya’s civil war. While Republicans have focused relentlessly on the terrible deaths of the U.S. diplomats, the larger disaster is the ensuing chaos that left Libya without a functioning government, overrun by feuding warlords and extremist militants. In 2015, the suffering of desperate refugees who flee civil unrest — many of whom drown in the Mediterranean Sea — is a direct consequence of that disastrous operation. Libya was part of a pattern for Clinton. On Afghanistan, she advocated a repeat of the surge in Iraq. When the top U.S. commander in Kabul, General Stanley McChrystal, asked Obama for 40,000 more troops to fight the Taliban in mid-2009, several top officials — including Vice President Joe Biden — objected, insisting that the public had lost patience with a conflict that had already dragged on too long. But Clinton backed McChrystal and wound up favoring even more surge troops than Defense Secretary Gates did. Obama ultimately sent another 30,000 American soldiers to Afghanistan. Clinton’s State Department also provided cover for the expansion of the not-so-covert drone wars in Pakistan and Yemen. Clinton’s top legal adviser, Harold Koh, exploited his pre-government reputation as an advocate for human rights to declare in a 2010 speech that the government had the right not only to detain people without any charges at Guantanamo Bay, but also to kill them with unmanned aerial vehicles anywhere in the world. When it came to Syria, Obama’s top diplomat was a forceful advocate for military intervention in that nation’s civil war. When Obama threatened air strikes in 2013 to punish the Assad regime’s use of chemical weapons, for example, Clinton publicly supported him, ignoring polls showing that more than 70 percent of Americans opposed military action. She described the planned U.S. attack on Syria as a “limited strike to uphold a crucial global norm,” although one of the clearest global norms under the UN Charter is that a country should not attack another country except in self-defense. Clinton advocated arming Syrian rebels long before the Obama administration agreed to do so. In 2012, she allied with CIA Director David Petraeus to promote a U.S.-supplied-and-trained proxy army in Syria. As a U.S. Army general, Petraeus spent enormous amounts of money training Iraqi and Afghan soldiers with little success, but that did not deter him and Clinton from seeking a similar project in Syria. Together, they campaigned for more direct and aggressive U.S. support for the rebels, a plan supported by leading Republicans like John McCain and Lindsey Graham. But few in the White House agreed, arguing that it would be difficult to appropriately vet fighters and ensure that weapons didn’t fall into the hands of extremists. Clinton was disappointed when Obama rejected the proposal, but a similar plan for the U.S. to “vet and train moderate rebels” at a starting cost of $500 million was later approved. Some of the trained rebels were quickly routed and captured; others, more concerned with toppling Assad than fighting Islamic State in Iraq and Syria (ISIS) defected to the al-Qaeda-affiliated al-Nusra Front. In September 2015, the head of U.S. Central Command, General Lloyd Austin, told an incredulous Senate Armed Services Committee that the $500 million effort to train Syrian forces had resulted in a mere four or five fighters actively battling ISIS. Undeterred, Clinton said that as commander-in-chief, she would dramatically escalate the program. In October 2015, Clinton broke with the Obama White House on Syria by calling for the creation of a no-fly zone “to try to stop the carnage on the ground and from the air, to try to provide some way to take stock of what’s happening, to try to stem the flow of refugees,” she said in a TV interview on the campaign trail. While the Obama White House has approved air strikes against ISIS, it has resisted creating a no-fly zone on the grounds that the effective enforcement to prevent Assad’s planes from flying would require large amounts of U.S. resources and could pull the military further into an unpredictable conflict. Clinton’s position is at odds not only with President Obama, but also with the position of Bernie Sanders, her main rival for the Democratic presidential nomination. Sanders has warned that a unilateral U.S. no-fly zone in Syria could “get us more deeply involved in that horrible civil war and lead to a never-ending U.S. entanglement in that region,” potentially making a complex and dangerous situation in Syria even worse. Clinton did come out in support of President Obama’s nuclear deal with Iran, but even that position comes with a heavy load of bellicose baggage. Back in April 2008, Clinton warned that the U.S. could “totally obliterate” Iran in retaliation for a nuclear attack on Israel — prompting Obama to warn against “language that’s reflective of George Bush.” In 2009, as secretary of state, she was adamant that the U.S. keep open the option of attacking Iran over never-proven allegations it was seeking the nuclear weapons that Israel already has. She opposed talk of a “containment” policy that would be an alternative to military action should negotiations with Tehran fail. To bolster her tough stance, Clinton suggested deploying additional U.S. forces to the Persian Gulf region and recommended that Congress close any gaps in the existing sanctions to punish Iran for any current or future instances of human rights abuses and support for terror. It’s true that the Iran nuclear agreement allowed for additional possible sanctions unrelated to Iran’s nuclear program, but it also required parties to avoid action “inconsistent with the letter, spirit and intent” of the deal. Clinton’s call for new sanctions violates the deal’s intent. Meanwhile, Clinton has positioned herself as more “pro-Israel” than President Obama. As secretary of state, Clinton missed opportunity after opportunity to shine as the nation’s top diplomat. In July 2010, she visited the Korean Demilitarized Zone with Defense Secretary Robert Gates to commemorate the 60th anniversary of the start of the Korean War. Standing at the site of the most militarized border in the world at a time of great tension between North and South Korea, she could have publicly recognized that the 1953 armistice that ended the fighting on the Korean peninsula was supposed to be followed up a few months later by a real peace treaty but never was. Clinton could have used this occasion to call for a peace treaty and a process of reconciliation between the two Koreas. Instead she characterized the decades-long U.S. military presence in Korea as a great success — a statement hard to reconcile with 60 years of continuous hostilities. It was only after Clinton resigned as secretary of state and was replaced by John Kerry that the State Department moved away from being merely an appendage of the Pentagon to one that truly sought creative, diplomatic solutions to seemingly intractable conflicts. President Obama’s two signature foreign policy achievements — the Iran deal and the groundbreaking opening with Cuba — came after Clinton left. These historic wins serve to highlight Clinton’s miserable track record in the position. As a lawmaker and diplomat, however, Clinton has long championed military campaigns that have killed scores of “everyday” people abroad. As commander-in-chief, there’s no reason to believe she’d be any less a war hawk than she was as the senator who backed George W. Bush’s war in Iraq, or the secretary of state who encouraged Barack Obama to escalate the war in Afghanistan. Clinton may well have been the administration’s most vociferous advocate for military action. On at least three crucial issues — Afghanistan, Libya, and the bin Laden raid — she took a more aggressive line than Defense Secretary Gates, a Bush-appointed Republican. Let’s call it what it is: more of the interventionist policies that destroyed Iraq, destabilized Libya, showered Yemen with cluster bombs and drones, and legitimized repressive regimes from Israel to Honduras. A Hillary Clinton presidency would symbolically break the glass ceiling for women in the United States, but it would be unlikely to break through the military-industrial complex that has been keeping our nation in a perpetual state of war — killing people around the world, plenty of them women and children. Donald Trump got the support of 45% of registered Republicans in New York State, according to the latest Siena Research Institute poll — a level more than double of his next closest competitor. Despite holding a wide lead among Republican New York voters in the race for the GOP nomination, Donald Trump would get crushed in a hypothetical general election matchup with Hillary Clinton in the state, a new poll released Monday shows. Clinton would beat the outspoken real estate magnate in the Empire State 57% to 34%, the latest Siena Research Institute poll found. In such a matchup, registered Democrats overwhelmingly support the former secretary of state (80% to 15%), and registered Republicans overwhelmingly support the Trump (71%, to 19%), while independent voters lean toward Clinton (45% to 38%), according to the poll. The former secretary of state would also beat Marco Rubio (56% to 35%), Ted Cruz (58% to 33%) and John Kasich (49% to 42%), who would give Clinton her best competition, the poll of 800 registered New York voters showed. Vermont Sen. Bernie Sanders also handily beat all of the Republi.can challengers, including Trump, in hypothetical general election matchups in the state, the poll found. If former New York Mayor Michael Bloomberg were to jump into the race, he would draw his support more heavily from Democratic voters than from Republicans, the poll found. In a hypothetical three-way matchup, Clinton would still carry New York State with 42% support, compared with 25% for Trump and 26% for Bloomberg, the poll found. In the race for the Republican Party nomination, meanwhile, the Queens-born Trump held a “yuge” lead, according to the poll, getting the support of 45% of registered Republicans in the Empire State — a level more than double of his next closest competitor. Florida Sen. Marco Rubio and Ohio Gov. John Kasich trailed far behind with 18% support each, while Texas Sen. Ted Cruz got 11%. Hillary Clinton got 55% of New York Democratic voters in the same poll, compared with just 34% for Bernie Sanders. Clinton, a former New York senator, also held a big lead over Sanders in New York State for the Democratic nomination. Clinton got 55% of New York Democratic voters, compared with just 34% for Sanders. The former secretary of state outperformed Sanders among women and African-American voters. Sanders performed better with voters younger than 35. The New York primaries for both parties are on April 19. The poll also showed that New Yorkers overwhelmingly think the U.S. Senate should act on an Obama Supreme Court nomination (67% to 28%), that the detention center in Guantanamo Bay should remain open (53% to 38%), but also found that New York State residents are split in their opinions over whether Apple and other technology companies should unlock phones belonging to terrorists. A little after midnight EST on Wednesday, both candidates had won seven states. Speaking at a rally in Miami, Florida, Clinton appeared to be eyeing the general election as she blasted the Republican front-runner Donald Trump. “It’s clear tonight that the stakes in this election have never been higher and the rhetoric we are hearing on the other side has never been lower”, said Clinton. Two-thirds of her voters want to continue President Barack Obama’s policies, rather than shift in a more liberal direction. Mrs. Clinton, again chiding the Republican frontrunner, said: “The work is not to make America great again”. Neither Mr. Trump nor Mrs. Clinton is ideally suited to quell the political situation of the United States in 2016, where discontent understandably ranges from the hard political Right to the hard political Left, from the young to the old, from the activists in both the Tea Party to Black Lives Matter. “Trump’s dominance has rattled Republican leaders, who fear he’s unelectable against Clinton in November”. Ryan’s comments came as many in the Republican Party struggle to come to terms with the growing possibility that Trump will be their nominee, with some Republicans repudiating him while others offer him their support. Instead, he’s watched Trump, a brash NY real estate mogul, display surprising strength with the region’s evangelical Christians and social conservatives. “I’d like to congratulate our Senator Ted Cruz for winning the biggest prize on Super Tuesday”, said Texas GOP Chairman Tom Mechler. “I congratulate Sen. Sanders for his strong showing and campaigning”, Clinton told supporters in Florida, looking ahead to a coming primary state. Rubio emerged Tuesday with his first victory, in the Minnesota caucuses, but did not live up to the wider hopes of the numerous Republican officeholders who have promoted him as the party’s best alternative to Trump. According to the Texas Democratic Party, 29 super delegates are allocated for the Lone Star state, which brings its total to 251, the most of any Super Tuesday state. Conversely, voters who said honesty mattered most to them broke overwhelmingly for Sanders, and 7 of 10 who valued most the phrase “cares about people like me, ” also chose the Vermont senator. Democrat Bernie Sanders picked up his home state of Vermont, as well as Oklahoma, Colorado and Minnesota, but failed to broaden his appeal with minority voters who are crucial to the party in presidential elections. Trump has won at least 175 of the delegates at stake in Tuesday’s contests. 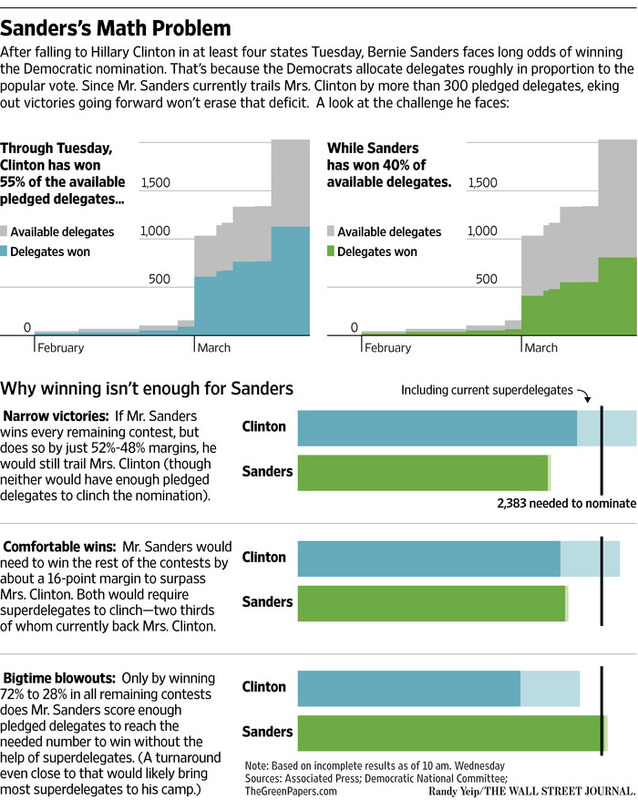 The “Super Tuesday” contests showed Clinton reclaiming her mojo against Bernie Sanders. Sanders has at least 319. It takes 2,383 delegates to win the nomination. Trump is leading the Republicans and Hillary Clinton is the Democratic front-runner. But the race also featured states like Massachusetts, Vermont, and Virginia that should have been Marco Rubio territory. But under party rules you only need to win 3.51 delegates to round up to 4 delegates and split the district’s prize. Ohio Gov. John Kasich has won at least 17 delegates and retired neurosurgeon Ben Carson has won at least three. Trump led in all of those categories, but was most dominant among the almost 1 in 5 Republican primary voters who called immigration the most important issue. Trump’s victory was narrower than he thought it would be - he has taken six of the 11 states so far: the southern belt of Georgia, Alabama, Arkansas, Tennessee and Virginia, with MA. The exit poll was conducted by Edison Research for The Associated Press and television networks. Forget the Nuclear Triad, Show Him the Button! Will Trump flunk the commander-in-chief test? The real-estate mogul thinks he’s got what it takes. The GOP establishment thinks otherwise. The Republican defense establishment is terrified Donald Trump will fail the “commander in chief test” with voters should he continue to defy all predictions and become the GOP nominee. Just a few months ago, at an annual gathering of national security leaders at the Ronald Reagan Presidential Library in California, former Republican lawmakers and national security officials openly dismissed the real estate mogul-turned-entertainer, predicting his campaign for the White House would soon falter. But with Trump’s steady rise in the polls, even as national security has loomed ever larger in the campaign, they are now officially spooked by his apparent lack of preparedness to be commander-in-chief — and what it could mean in a head-to-head contest against the Democratic favorite, former Secretary of State Hillary Clinton, according to interviews with more than a dozen Republican lawmakers and national security experts. Trump has made a long list of curious statements on foreign policy. In a recent debate, he didn’t seem to know about the “nuclear triad” — the nuclear-armed bombers, land-based missiles and submarines that make up the U.S. atomic arsenal. He has confused the F-35 fighter jet with the Long-Range Strike Bomber, and the Kurds with Iran’s Quds Force. He’s said he gets military advice watching television, has praised U.S. foes like Russian President Vladimir Putin and has shown no apparent interest in seeking the counsel of the party’s national security sages. “He wouldn’t just get an F — he’d get a zero,” said Richard Fontaine, president of the Center for a New American Security, who is backing Florida Gov. Jeb Bush and is a former top aide to Sen. John McCain, the 2008 GOP presidential nominee who now chairs the Armed Services Committee. And McCain, whom Trump mocked last year for having been a prisoner of war in Vietnam, has repeatedly slammed Trump’s claim that he’ll convince Mexico to pay for a wall along the U.S. southern border. “If he’s the nominee, he’ll have a pretty steep learning curve. I think that’s pretty obvious,” McCain told POLITICO. But in the view of the GOP defense establishment, Trump has emerged as a key threat to the party’s strategy to make national security and foreign policy a cornerstone of the race for the White House, as well as the case against Clinton. Indeed, at the Reagan Forum, the assembled experts dismissed both Trump and rival candidate Ben Carson as little more than a bad joke in panel after panel, offering the mantra that both anti-establishment campaigns would falter once voters started paying attention to national security. Then came November’s deadly terrorist attacks in Paris and December’s mass shooting in San Bernardino, Calif., which placed terrorism high on the list of voter concerns. But while Carson stumbled, as predicted, Trump has only grown stronger with Republican primary voters. “Obviously, nobody really took Trump seriously for quite time. Now, of course, he can’t be ignored,” said Dov Zakheim, who was a senior foreign policy adviser to former President George W. Bush and served as the Pentagon’s budget chief in the Bush administration. He is not backing any candidate in the 2016 race. Also galling to longtime GOP defense leaders: Unlike the other candidates, Trump does not appear to have reached out to any of the traditional advisers on foreign policy and national security. Analysts at the major conservative think tanks and others who have briefed 2016 candidates say they’ve heard nothing from Trump’s campaign — and know no one advising him. “Absolutely none that I am aware of,” said Eric Edelman, an adviser to 2012 GOP presidential nominee Mitt Romney who co-founded the John Hay Initiative, which has briefed multiple candidates and offered a foreign policy playbook to all of the 2016 field. When Donald Trump could not answer Hugh Hewitt’s question on the nuclear triad during the fifth GOP debate Tuesday night, Sen. Marco Rubio (R., Fla.) was kind enough to take the time to explain what the nuclear triad was to him and any other Americans who may not have known. Trump was asked to offer his opinion on which leg of the nuclear triad, decried by many as outdated, he believed was most crucial to update. The Republican frontrunner did not appear to understand the topic. In his original answer, Trump said it was important to have a strong leader with sound judgment during perilous times. He then trailed off to talking about opposing the Iraq War and how important limiting nuclear proliferation is. The response did not touch on Hewitt’s question, so he asked again. “I think for me nuclear – the power, the devastation is very important to me,” Trump said in his second attempt. Hewitt then offered the question to Rubio. The young senator elected to explain what the nuclear triad is to “people at home,” although it appeared to be a veiled swipe at Trump for not knowing what it was. Rubio delivered a summary of the nuclear weapons delivery system of the U.S.’s nuclear arsenal. He listed off the three legs: strategic bombers, intercontinental ballistic missiles, and submarine-launched ballistic missiles. While he claimed all three were critical to create a deterrent for the enemies of America, Rubio said submarines have become more critical. He advocated for the upgrading of the Ohio submarine fleet, called for upgrading the B52, and wanted a modernization program for ballistic missiles.